If you have your sights set on moving to Glasgow, you’ll soon find there’s a lot to love about this Scottish city. Set on the meandering banks of the River Clyde, Glasgow is the largest city in Scotland and the fourth largest in the United Kingdom. Oh, and it also has the longest bar in Europe, in case that’s a selling point for you. Home to the first international football match in 1872, Glasgow is a sport loving, bustling center of many major industries, enjoying a very diverse economy which isn’t as reliant on specific industries as other UK cities. Glasgow also enjoys a culture spanning all walks of life and was given the prestigious title of European City of Culture in 1990. The city embraces its cultural obligations with a passion rivaled only by Edinburgh. The museums, music and events create a breath-taking ambiance throughout the city and its rich industrial legacy is still very much in evidence in the architecture. Glasgow is a very reasonably priced place to live but still enjoys all the glitz and glamour you’d expect from a major city. The job markets remain buoyant and as a city Glasgow has suffered very little from the recession. With that in mind we take a deeper look into what you need to know if you are thinking of moving to Glasgow. With the fourth largest UK economy, Scotland has a $21.12 billion gross value added economy and supports over half a million jobs. That said the economy is still dominated by the service sectors with finance increasingly playing a major role in shaping the Glaswegian economy. Glasgow has experienced rapid economic growth despite the recession and ranks amongst Europe’s top 10 highest growth rates – currently at 4.4% per annum, second only to London in the UK. It is also the 16th largest economic center in Europe and remains one of the largest manufacturing centers in the UK. Manufacturing – Despite the move nationwide to service based economies Glasgow still enjoys a major manufacturing industry that encompasses everything from vehicles to Whisky. Some of the major companies in the area include British Polar Engines, Albion Motors, Aggreko, Weir Group, Howden, Linn Products, Whyte and Mackay and William Grant. The manufacturing industries play an important part in Glasgow’s diversity and contribute a significant portion to the skilled and unskilled labour markets. Retail – Glasgow is the largest retail hub in Scotland and there are nearly 40,000 people employed in this sector. With major malls and rejuvenated city center shopping retail continues to be strong in the city – accounting for 10% of all the employees throughout the city. Despite the shifting retail landscape Glasgow is likely to retain its retail size given its large catchment area for Scotland. Finance – The Glaswegian financial services sector is booming and growing at a pace that outstrips all the UK cities except London. With over 25,000 people employed in this sector it is a great destination for anyone skilled in finance, investing or insurance. Major companies include Barclays Wealth, JPMorgan, Morgan Stanley, and RBS. This is a key area of investment in the city and we expect the industry to continue its growth rate (of around 5% per annum) for the foreseeable future. Business Services – Like the financial services sector Glasgow business services sector is also booming. With nearly 50,000 jobs across a broad spectrum of positions and niche sectors this accounts for nearly 14% of the Glaswegian economy. You can find many major brands represented here including Xansa, Accenture, Logica CMG, Ceridian and Glasgow Interactive. Health – Glasgow is home to Scotland’s largest hospitals both private and public with the sector employing 60,000 people in various roles. The NHS hospitals are the largest employers though the health service sector covering care and other health support services is of a similar size. In addition to health care Glasgow is also home to a number of large pharmaceutical companies including Ethigen and AAH Pharmaceuticals. Glasgow’s diverse economy means there are lots of opportunities whatever your skill set. If you’re planning to move here you won’t be short of job opportunities or career progression prospects in any sector. 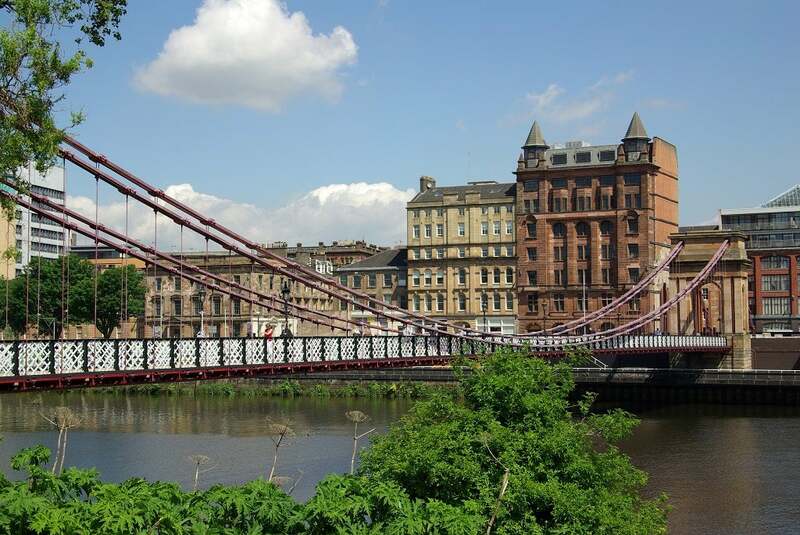 There are several different aspects to the cost of living in Glasgow that you should familiarize yourself with before you move there. Despite its size Glasgow remains one of the less expensive cities in the UK. Rent prices are relatively low compared to other city centers such as London and Edinburgh. A single bedroom apartment in the city center costing on average $683 per month, while a three bedroom house or apartment in the city center will cost on average $1,093 per month. Outside of the city center prices drop with a small single bedroomed apartment costing on average $572 per month and a 3 bedroom house or apartment costing $876. Transport and other living costs are reasonable with monthly bus tickets costing around $56. This is cheaper than other major UK cities and the infrastructure is very good. In terms of eating out and entertainment you’ll be spoilt for choice in Glasgow. Cheap pub meals start from just $10 and you can enjoy a superb 3 course meal for as little as $50. This is marginally cheaper than other major UK cities and there is plenty to choose from. Entertainment is plentiful with comedy nights, theater, live music and a wide range of eclectic tastes are catered for. Property prices in Glasgow are much lower than other major UK cities. The average house price is just $183,260. Of course like any city some areas are much more expensive than others. A two bedroom house in some areas will cost just $74,550 though these tend to be the less salubrious areas. The nicest areas tend to be in the West End with Byres Road, Hillhead, and Partick being the most recommended (and the most expensive). Further afield Scotstoun, Anniesland, Jordanhill, and Knightswood all have good reputations and are not too expensive. Some properties in these areas go for $372,400 and upwards. A city center apartment in the recently redeveloped waterfront cost from $124,136 but you can enjoy a great city center location. Family-friendly: The south side of the city is becoming increasingly popular, as it has good eateries and restaurants as well as open space. The south side is rapidly becoming an ideal place to raise a family, have a community lifestyle but still be near the heart of Glasgow. With numerous primary and secondary schools, it represents the perfect location for young families looking to have their first home. Langside is certainly worth considering. Upmarket: The West End around the University and further out at Bearsden and Milngavie are sought after areas. The South Side and heading south from the city is where the more attractive locations are. There are good transport connections into the city center for commuting and a wider variety of housing available. Kelvinside is another part of Glasgow is traditionally popular, with a reputation for being arguably the most upmarket part of the city. Properties there usually far outstrip the cost in other areas. Hip & trendy:The Merchant City is one of the trendiest areas to live. The old tobacco warehouses have been transformed into loft-style apartments and a designer shopping outlet area built nearby. If you are looking for trendy mezzanine apartments and penthouses then George Square and the old Post Office building is recommended. A lower cost alternative is Berkley Street, close to Mitchell Library. Up & coming: Dalmarnock is fast becoming one of the most rejuvenated areas in the city center benefiting from the Commonwealth Games legacy. A new school and further housing are being built in the area. The south side of Glasgow continues to become ever popular and a series of new housing developments have begun in the New Gorbals. Around Crown Street and the nearby newly constructed Glasgow City College campus, modern housing is being developed. The unique brickwork and layout of the apartments, with large windows and panoramic views across the area, is replacing the old apartments once seen in the area. Broomielaw is enjoying a new lease of life, with abandoned office complexes being converted into swish new apartments. Moving to Glasgow is little more expensive than any other major UK city. If you are travelling from outside the UK and need to ship your belongings the table below gives you a rough idea of the prices you would expect to pay to relocate. The exam system is different in Scotland to the rest of the UK. Glasgow’s education system has a reputation for not meeting the standards of many other major cities. In 2013 only one public school, Jordanhill School, had nearly 50% of pupils attaining 5 GCSE grade A-C. This means that many parents look to the independent schools for higher education – and there is fierce competition. The most prestigious and highest performing independent schools are St. Ninian’s High School, Williamwood High School and Mearns Castle High School. All of these are located in East Renfrewshire which is a very prosperous area South of Glasgow. In terms of secondary education it may be worth looking into boarding schools; if money is an object then you will need to find the schools that give your children the most personal attention possible. The locals take great pride in being Glaswegian, and you may find the nuances of the language a little hard to grasp upon first arriving; but you’ll soon pick it up! Glasgow is such a large and varied city that there is always something to do. The city is home to the Scottish Opera, Scottish Ballet and National Theater of Scotland as well as acclaimed museums, historic architecture and cultural places of interest. Browse through the largest public reference library in Europe, the stunning Mitchell Library, or spot the miniature Statue of Liberty in Glasgow City Chambers. A multi-cultural range of restaurants is available for all budgets, and there are also plenty of facilities for those who are sports minded (remember it is home to one of the venues for the 2012 Olympics and 2014 Commonwealth Games). Glasgow is well connected to the wonderful surrounding scenery and countryside where outdoor pursuits are freely available.